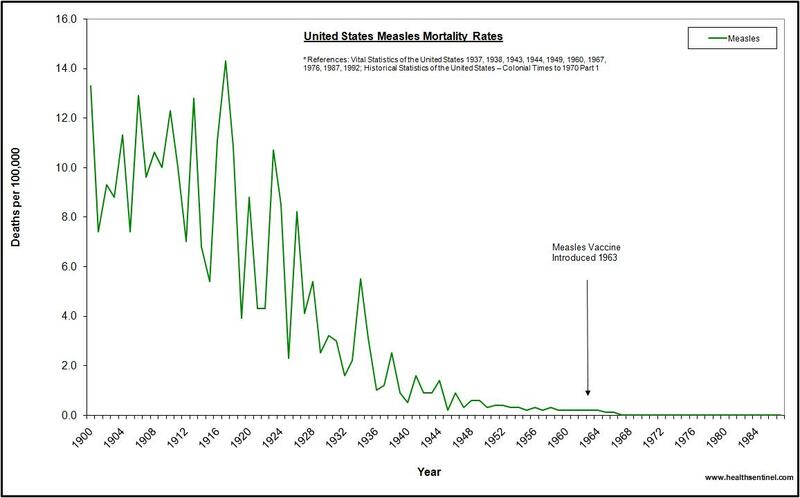 Some will try to argue that measles deaths are essentially nonexistent now because of measles vaccines, the first of which was introduced in 1963. But this argument holds no water — U.S. measles mortality data shows that deaths from measles rapidly declined in the years leading up to when the first vaccine was introduced, validating the success of improved sanitation and better nutrition in making measles a non-problem. “What you may not have heard, is that by 1963, the death rate from measles in the United States had already dropped by approximately 98%,” explains the International Medical Council on Vaccination (IMCV). This entry was posted on February 6, 2015 by Amir Alwani. It was filed under health, news, science, studies, vaccines and was tagged with CDC. I know vaccines are not good…I have witnessed my son left nearly dead ..he survived but had a left sided paralysis from Encephalitis. ..when challenged the pharmaceutical company denied…then within 12 months the vaccine was withdrawn after more deaths and severe reactions. The human species has outgrown the bulk of these old diseases. The injectable vaccination scam was spread to dispose of toxic byproducts of industrial manufacturing. Great fines and fees have to be paid following EPA standards to dispose of toxic materials, unless another purpose can be found for them. And there enters Carnegie and his efforts to buy the medical schools to implement chemical pharmacology.